This is my final post about my recent sculpting projects, which will bring you up to the present. I decided to sculpt something that would have practical value, like a piece of furniture. What emerged in my mind was a glass table top supported by arms and hands carved from various wood species, giving the impression of a multiplicity of folks of different ethic backgrounds coming together. I call this piece The Gathering Place and it measures about three feet in diameter. 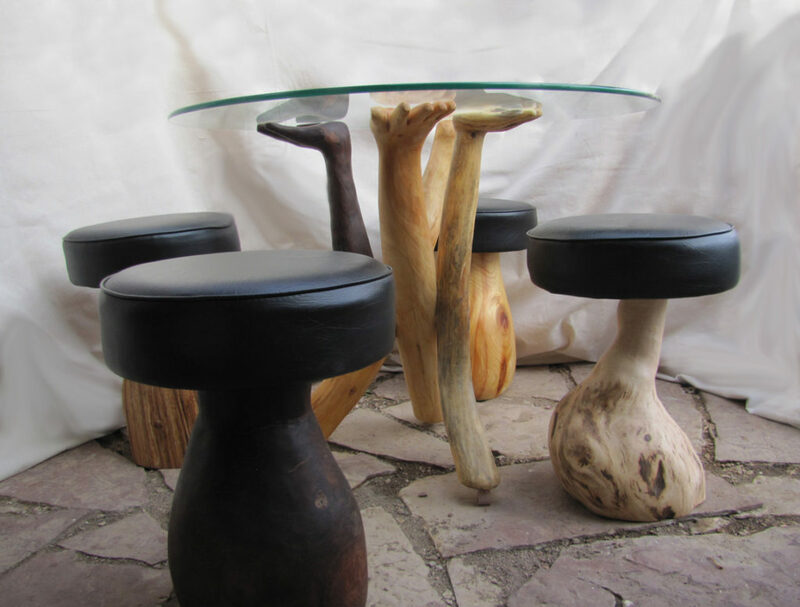 Once I had made the table, I realized that it really needed some carved stools surrounding it, so I provided more wood varieties as bases and attached some nice cushioned seats. 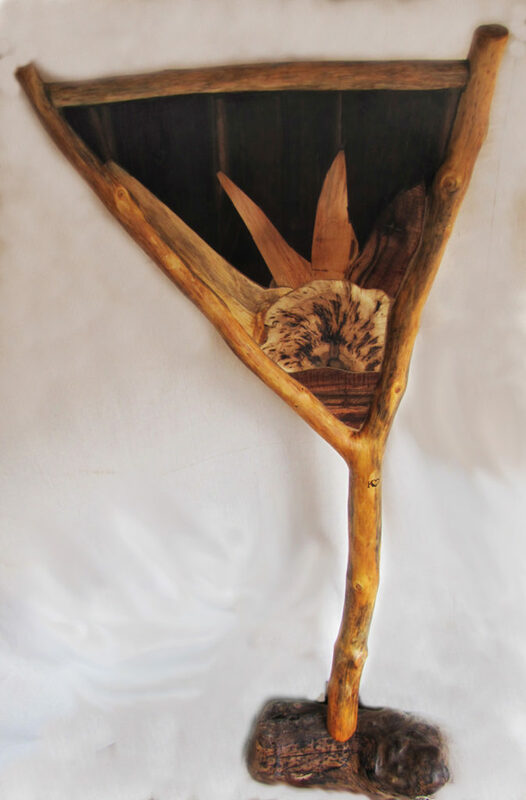 I have always admired well done wood inlay projects, so I decided to try a new twist on the concept by fashioning a free-standing sculpted form that appeared like a tree standing in the forest with light emerging between the branches. The Light in the Woods is what resulted. The base is a heavy oak burl, the tree is a pine branch, and the wood inlay is with walnut, oak, cherry and pine. The most precise piece I have attempted yet is a large Icosidodecahedron. This spherical shape is composed of 12 pentagons and 20 triangles, all with precise measurements and angles. 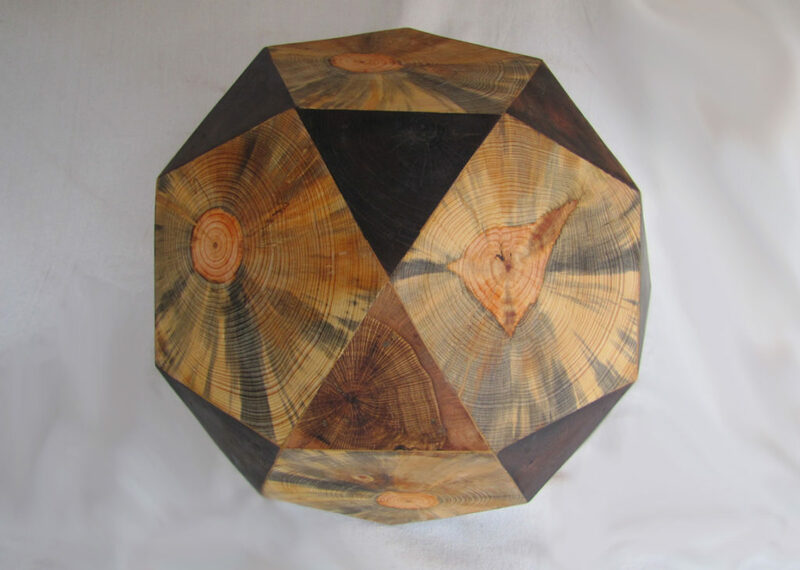 It is composed of pine, walnut and oak and is hollow. The diameter of the enveloping sphere is about 20 inches. My most recent piece resembles the very first sculpture I created about 1 1/2 years ago, and is another Ent-like creature. 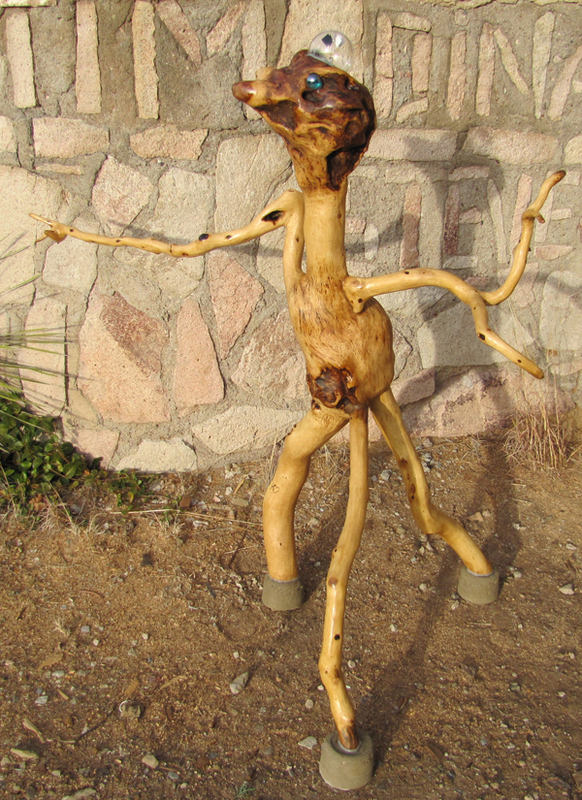 His name is Elwood and he is carved from a natural oak burl form with a few added appendages. This whimsical sculpture is intended to be outdoors; his little brain spins when the sun shines. Hi Kelly. your wood sculpturing is awe inspiring! thank you so much for sharing these posts and the photos and descriptions with us. yes, this is definitely part of natural building. balancing the creative nature of our hearts and minds, being guided to bring the wood to life in many ways. Beautiful work! Very creative use of natural material. You’ve brought out the inherent beauty of the wood for everyone to see. Thanks for sharing!